Best Toilet Flange of 2019 – Excellent Selections by Expert! 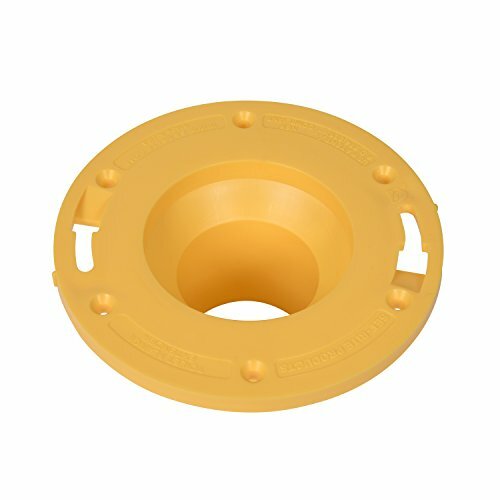 Toilet flange also referred to as closet flanges, toilet flanges are the point of contact between toilets and the drainpipes located on the floor. With this in mind, the best toilet flange should have a good seal so as to prevent any smell from the sewer lines from entering your house. The product should also prevent any leakages from leaking out to the floor as you flush the toilet. Therefore, it is important always to buy the best toilet flange so as to avoid any of these problems. This article looks at 5 of the best ones in the market, with a view of helping you pick the best one to suit your needs. This product is innovatively designed to take the guesswork out of toilet installation. It has a black plastic ring located inside the grey rubber housing that is removable to allow the seal to compress fully on itself. Therefore, if the flange and horn are very high above the tiled floor, you can remove this plastic so that the toilet can compress the flange and seat flush on the floor. 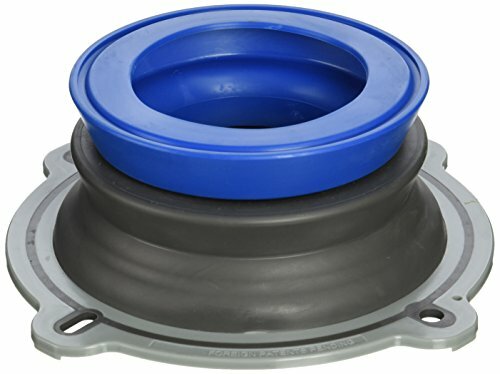 On the drain part, this unit features a patented seal design that makes use of specially made rubber gasket that is encapsulated with wax. This forms a seal, which is 3 times stronger than regular wax rings and does not cause any mess. 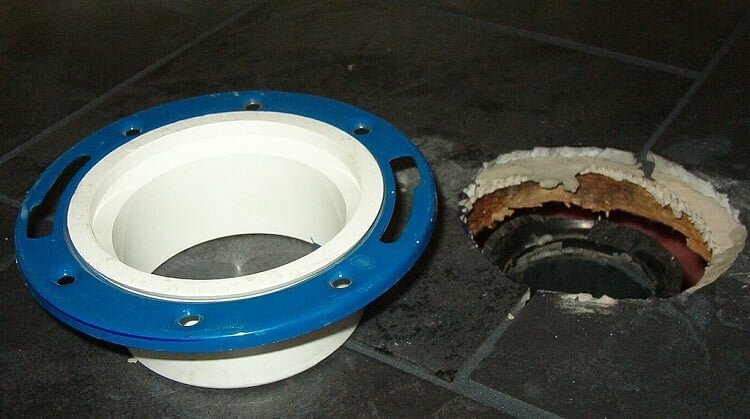 The gasket grabs the toilet while the wax is pushed down the walls of the drain pipe, ensuring that a strong seal is formed between the drain pipe wall and the flange sleeve. Such a strong seal means that the toilet flange can maintain its integrity even with small toilet movements, which are very common as you use it. Structurally, this unit is made from plastic but it is strong enough to stabilize toilet bolts so that the toilet can attach firmly onto the floor. Accommodates flange heights of between 0.5 inches above the floor (due to the removable plastic) to 1.5 inches below the floor. Specially designed rubber gaskets that are encapsulated with wax. Can fit drainpipes of any size since the wax fills the gap between both the flange wall and the drainpipe wall. Bathroom renovations might include new flooring and most of the time, the floor gets raised. This brings about refitting issues on the toilet because the existing flange gets sunk below the floor surface. As a result, you can be sure that leakages will occur. Well, with Oatey’s 43405 toilet flange extender, this won’t be a problem. This is a top rated product that is available in different sizes to cater for the different depths that the flange is sunk below the surface. In terms of size, the spacers come in a variety of sizes, which include 1/8, 1/4, 1/2 and 3/4 inches in width, and they can be combined to form thicker spacers. 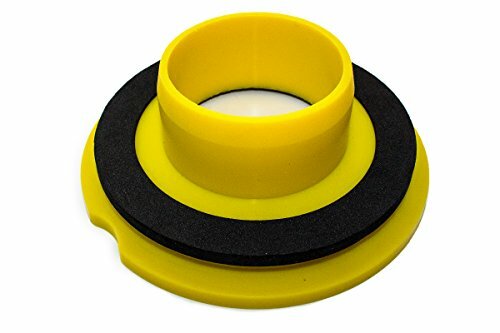 In total, they can elevate the flange from 1/4 inches to 1-5/8 inches with the inclusion of a foam gasket and the yellow extender. 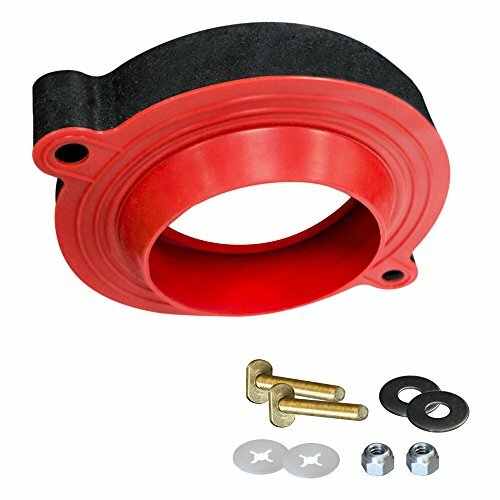 All these parts are quite easy to install and can work on any type of flange, from PVC/ABS and cast iron to even the uneven and broken ones, and in the process, the whole setup sort of renews the whole existing flange. Construction wise, the extender is made of durable plastic and features a wax ring that sits between the extender and the toilet for creating a tight seal. Raises/ extends the existing toilet flange in the range of 1/4 to 1-5/8 inches. Can be bought as an extender alone or a kit consisting of the extender and differently-sized spacers. Can be used to extend any type of toilet flange. Flexon’s toilet flange is more expensive than the rest of the products in this review but this can be mostly attributed to the fact that it comes as a full kit. This kit contains the toilet flange, 8 spacers and a patented toilet seal gauge, which is used to verify that the seal is made before setting the toilet above the flange. Spacers ensure that the unit is at the correct height for screwing in the toilet. 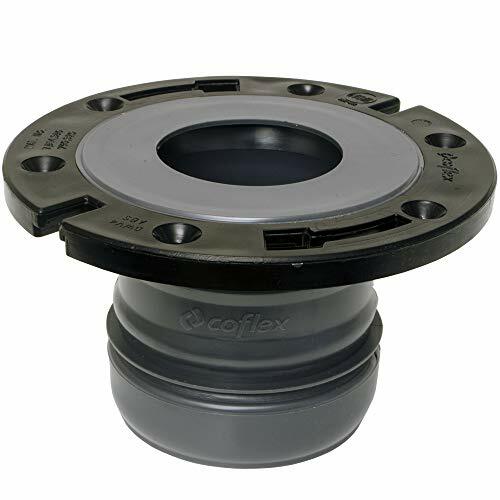 The flange is compatible with 4 inch PVC/ABS, cast iron or lead pipes, and features additional seals on the sleeve that seal it to any of these pipes, ensuring that there are no leaks or returns of odors. On the upper part, the seal that attaches to the toilet horn without requiring any wax. This is because it is designed to create a strong hermetic seal, which ensures there are no leakages. Apart from preventing leakages, Flexon’s toilet flange also corrects up to 1-inch offsets on the toilet and can also seal rocky toilets, which means that it can remain intact even with small toilet movements. Comes as a full kit containing a toilet flange, 8 spacers, a patented toilet seal gauge and a couple of screws. Compatible with 4 inch PVC/ABS, cast iron and lead drain pipes. Upper seal attaches hermetically to the horn. Corrects up to 1-inch offsets. Seal remains intact even if the toilet starts rocking. The Korky 6000BP has a universal design, which means that it can fit on both 3 and 4-inch drain pipes. It also means that this unit can fit on flanges that are above, at level with or below the floor surface and this is made possible using a two-piece foam on the interior, making it very adaptable. Construction wise, this seal is made of rubber, which gives it a couple of advantages. First, this seal eliminates the need for wax seals, which can be very messy. In case you don’t set the toilet properly the first time, rubber seals enable you to reset, not once, but multiple times. Wax seals are usually easily ruined and will require new ones if you mess up the toilet setting process on round 1. Wax seals are also prone to be affected by temperature changes, which means that they can freeze or melt as the temperature goes up or down. This might result in the occurrence of a sticky mess or a hardened block, effectively affecting the integrity of the seal. However, this rubber seal is resistant to temperature changes and thus, maintains the integrity of the seal all through. Can fit on both 3 and 4-inch drain pipes. 2-piece interior foams enable the seal to fit on flanges that are above, at level with or below the floor surface. Allows for toilet resetting multiple times. Leaknogasket’s wax-free toilet seal is very affordable but this does not mean that it is a low-quality product. Actually, it is quite cheap because it is only a seal but not a full toilet flange. This means that it needs to be fitted between the toilet horn and the flange or the drain pipe. On the upper part, this unit forms a seal below the surface of the toilet horn as well as around it. This double bond ensures that all the wastewater from the toilet flows down to the drain without any leakages. Material wise, the unit is made of heavy-duty silicon, which is very durable, flexible and makes the seal reusable just in case you change the toilet itself. Just like rubber, silicon is also not messy and can withstand extreme temperatures, making it even more durable. Forms a double seal with the toilet horn. Fits flanges that are 1/4 inches above to 1/2 inches below the floor surface. When it comes to toilet flanges, compatibility is usually considered in terms of the drain pipe size. Drain pipes are available in different sizes, with most of them being either 3 or 4 inches in diameter. Before buying a toilet flange, it is important to check the size of your drain pipe and then check whether the flange’s sleeve is compatible with that size. Alternatively, you can buy the universal fitting flange, which is suitable for drain pipes of all sizes. A critical part of any flange is the seal. It is available in 3 main types, which are wax, rubber or silicon seals. Wax seals are very good at forming watertight seals they are easily affected by temperature changes, which means that they can melt and get messy when it’s too hot or stiffen when it’s too cold. Either way, these conditions affect the integrity of the seal, making it prone to leakages. Again, when using wax, once you set the toilet above the flange, the wax sets itself such that any big movement such as removal of the toilet destroys the seal. On the other hand, rubber is reusable, which enables you to reset the toilet countless times without worrying about it getting damaged. However, with rubber, the seal must fit snugly over the toilet horn, toilet and drain pipe so that it forms a watertight bond. Silicon is more like rubber and thus, its properties are quite similar to those of a rubber seal. Most toilet flanges are made using plastic and specifically, a type of plastic called PVC. However, there are some variations of these, with some being entirely constructed out of PVC while others have a PVC body and a metallic horn. Another commonly used plastic is ABS. This material is more rigid than PVC and is also more resistant to heat and shock as compared to PVC. Plastic flanges are usually very affordable and are designed for 3 and 4-inch drainpipes. The main advantage with copper flanges is that they are highly resistant to corrosion and wear and tear, making them very durable. However, they are more expensive than plastic flanges. Cast iron flanges are quite expensive but very durable. They are available in a variety of sizes, with the deep-bodied ones being ideal for drainpipes that are quite low as compared to the toilet floor. With their strong, durable sleeves, they can extend deep down to reach the drain pipe so that water is passed from the flange to the pipe without any leakage. Aluminum toilet flanges are designed to be strong and durable by being corrosion resistant, yet lightweight for easy handling. Stainless steel flanges are also very durable because of their resistance to oxidation and corrosion, but they come at a high price. Similar to stainless steel, these are very durable. Generally, metallic toilet flanges are quite expensive than their plastic counterparts. However, they are very durable and are guaranteed to serve you for a long time. If you have renovated your bathroom floor, chances are that the floor raised a bit to leave the drain pipe sunk. It is important to consider the depth of this sunk pipe so that you can buy the appropriate flange that can extend to that level. Similarly, if the old flange is raised above the floor, you should buy a compressible unit so that it does not leave the toilet floating and loosely attached midair. Clearly, there is a lot about toilet flanges than their simple, rounded appearance. After going through this article, you will understand what the different features of these components mean in terms of the benefits they provide. With this information, I hope, you should be able to pick the best flange for your toilet from the 5 units reviewed above.